Welcome to A Week of KenKen (AWOKK). 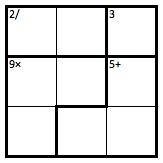 Every day this week, the MJ4MF blog will feature a new post about the number puzzle that Sudoku wishes it could be. That’s right — seven days, nothing but KenKen. If the Beatles got nothin’ but love, babe, eight days a week, then I can certainly have a week with eight days of KenKen. Deal with it. 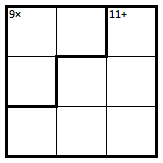 For an n × n grid, fill each row and column with the numbers 1 through n. A number may not be repeated in any row or column. Each heavily outlined set of cells, called a cage, contains a mathematical clue that consists of a number and an arithmetic operation: +, –, ×, or ÷. The numbers in that cage must combine (in any order) to produce the target number using the mathematical operation indicated. Cages with just one cell should be filled with the target number. A number may be repeated within a cage, provided it’s not in the same row or column. Entry filed under: Uncategorized. Tags: KenKen, puzzle, rules, Will Shortz.